The strength bear, strength and courage t-shirt is a stylish t-shirt that promotes being strong and courageous, just like Jesus Christ. A marine blue coloured t-shirt with writing in a yellow font saying 'Strength and Courage'. The word strength has a more prestigious font than the rest. "Be strong and courageous. Do not be afraid or terrified because of them, for the Lord your God goes with you; he will never leave you nor forsake you." - Deuteronomy 31:6. Strength and Courage T Shirt: Adult Small was published by Kerusso in April 2016 and is our 9648th best seller. The ISBN for Strength and Courage T Shirt: Adult Small is 612978271490. 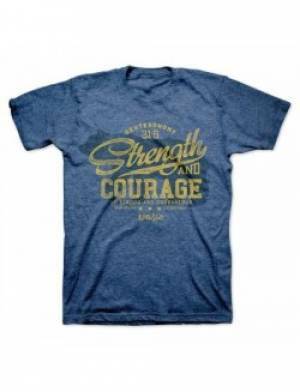 Be the first to review Strength and Courage T Shirt: Adult Small! Got a question? No problem! Just click here to ask us about Strength and Courage T Shirt: Adult Small.